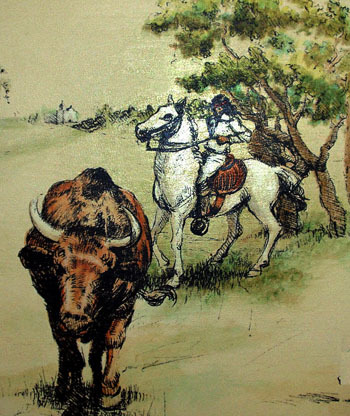 An Indian Vaquero, which were the first cowboys in Texas, herds a cow.Courtesy of the Texas Parks and Wildlife Department. Image available on the Internet and included in accordance with Title 17 U.S.C. Section 107. Richard King, an early ranch owner who recruited vaqueros from Mexico in 1854. Courtesy of the Bullock Texas State History Museum. Image available on the Internet and included in accordance with Title 17 U.S.C. Section 107. 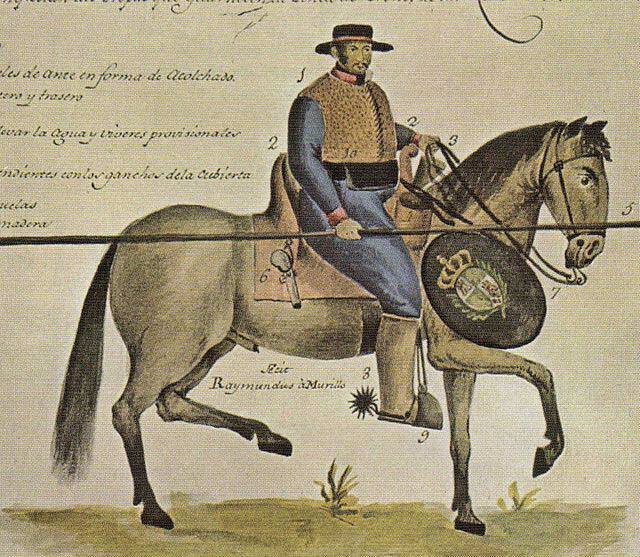 Illustration of a Spanish Vaquero. Courtesy of the Bullock Texas State History Museum. Image available on the Internet and included in accordance with Title 17 U.S.C. Section 107. Vaqueros herding cattle on Alta Vista Ranch. Courtesy of the Portal to Texas History. Image available on the Internet and included in accordance with Title 17 U.S.C. Section 107. VAQUERO. The vaquero, or cowboy, the mounted herdsman of the Spanish colonial period and his Mexican counterpart of the nineteenth century, is a historical figure that, like the Anglo cowboy, has attained romantic features and near-mythic stature. Actually, the Hispanic and Anglo cowboys faced many of the same harsh working conditions and had more aspects in common than is traditionally recognized. In Texas this was the case because Anglo stock raisers were heavily influenced by the Spanish ranching institutions that they found upon their arrival. Over a period of time, particularly between 1821 and the trail-driving era, many Spanish stock-handling techniques passed into the Anglo way of doing things, and the distinctions between the two traditions blurred. Although such was also the case in other border states, the influence of the Texas "system" was larger, since it extended onto the High Plains and overshadowed other methods of working cattle on the open range. Spanish vaqueros in colonial times were generally viewed by their society as a rough and rowdy lot. Many of them operated outside the law and preyed upon unbranded cattle that roamed the vast estates of northern Mexico. Often they were mestizo or semicivilized Indians on the lower rungs of the social ladder, but they were invariably noted for their horsemanship and stock-tending skills. As ranching made its way north to Texas through the tier of provinces along the Rio Grande, these herdsmen were the vanguard of Hispanic colonization. In many cases they attached themselves to a patrón (an influential rancher who owned a grant of land from the king), married, and built a shack on his property. Their children were born and raised in service to the patrón, an arrangement that sometimes spanned generations. Early Anglo ranch owners in South Texas, such as Richard King and Mifflin Kenedy, fell heir to this tradition, which continued well into the twentieth century. Through their working association with vaqueros, young Anglo cowboys learned their techniques and adopted them as a matter of course. From the era of the Texas Revolution and beyond, South Texas abounded in wild longhorn cattle, noted for their stamina and adaptation to the land. After the Civil War these herds increased dramatically and, when rounded up and branded, formed the basis for a number of prosperous huge ranches. Hired vaqueros figured in this process, as well as in the drives to railheads and northern markets. Not only did they ride for Anglo bosses, they on occasion took herds for Mexicans operators. By this time (1870s), the vaquero's saddle, chaps, bandana, sombrero, lasso, spurs, and even elements of his expertise were so widespread that they lost their Hispanic identity and became simply "Texan." See also RANCHING, and RANCHING IN SPANISH TEXAS. François Chevalier, Land and Society in Colonial Mexico (Berkeley: University of California Press, 1963). David Dary, Cowboy Culture: A Saga of Five Centuries (New York: Knopf, 1981). Jack Jackson, Los Mesteños: Spanish Ranching in Texas, 1721–1821 (College Station: Texas A&M University Press, 1986). Joseph J. Mora, Trail Dust and Saddle Leather (New York: Scribner, 1946). Nora E. Ramirez, The Vaquero and Ranching in the Southwestern United States, 1600–1970 (Ph.D. dissertation, Indiana University, 1978). Glenn R. Vernam, Man on Horseback (New York: Harper and Row, 1964). Handbook of Texas Online, Jack Jackson, "VAQUERO," accessed April 19, 2019, http://www.tshaonline.org/handbook/online/articles/pfv01. Uploaded on June 15, 2010. Modified on May 11, 2017. Published by the Texas State Historical Association.